Memories of Oman 2019 - "The Souq"
Oman, the land of Frankincense, Desert and History. 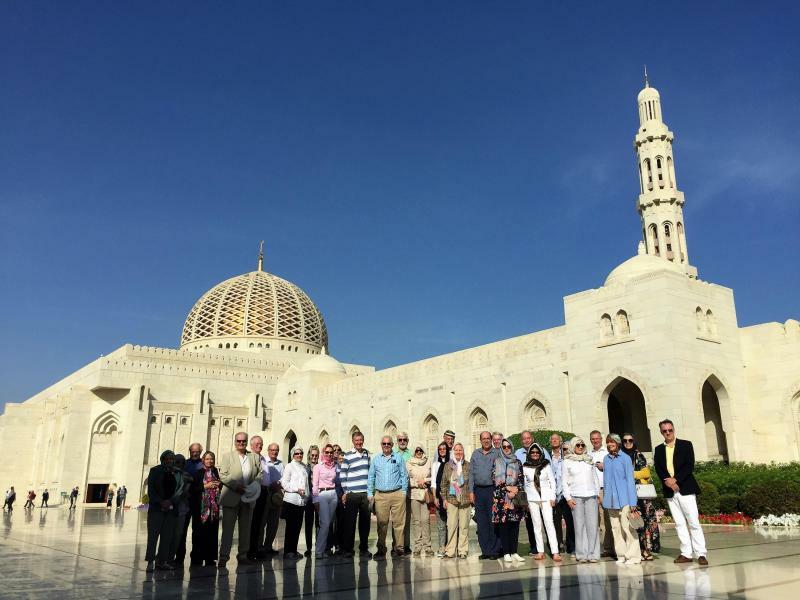 31 Fruiterers arrived in Muscat led by Master John Warner and Mistress Mavis. 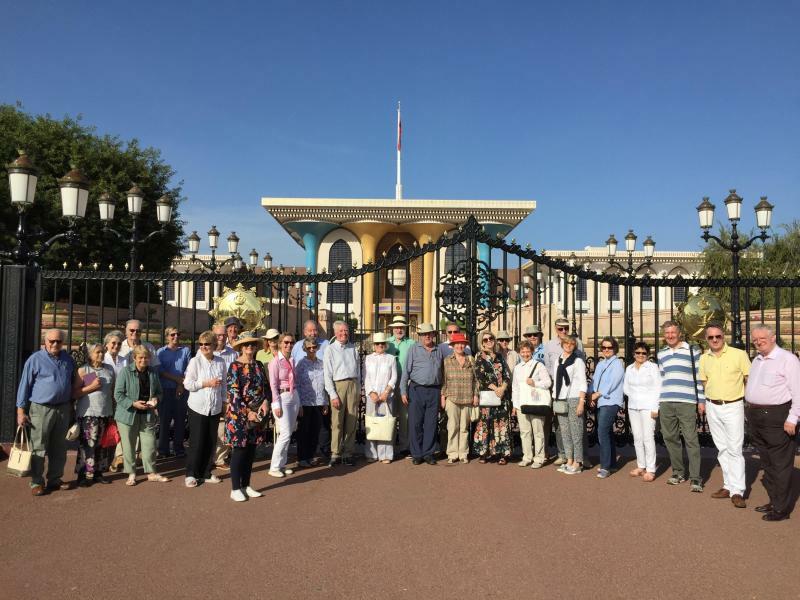 John and Mavis lived and worked in Oman in the early ‘80s and thought a trip down memory lane would be an experience Fruiterers would like to share. Indeed it was! The first morning we were taken on a tour of the Grand Mosque, heads covered, shoes off! Very grand it was too! Our excellent guide Qais gave us just the right amount of info and history, explaining along the way some of the intricacies of the Muslim faith. Our next stop was the Royal Opera House, another very impressive modern building where international stars perform. This was followed by a visit to the local ‘souq’ where the smell of frankincense was almost overpowering –some bargaining and purchasing was done by a number of intrepid Fruiterers! We then went to a museum at Bait Zubair where our understanding of Omani history and culture was further expanded. The following day our planned boat trip was cancelled due to the rough sea but we were able to explore a little further along the coast and look at more of the beautiful scenery. Some of the luxury resorts, hotels and marinas are beyond impressive. A day trip took us into the mountains and onto the plains with visits to two historic forts at Nizwah and Jabrin, followed by a visit to the old deserted village of Misfah where we walked through date palms and saw the old ‘falaj’ - an irrigation system transporting water from the mountains using gravity alone. The scenery was spectacular and varied, from huge mountains to rocky dunes and open gravelly plains. The next morning was spent visiting the new Oman Botanic Gardens. We were very lucky in that we were the first group to visit the gardens which at present are still under construction. In fact it is still just a holding area for collected plants and a propagating centre for collected seeds, cuttings etc. It was a fascinating morning and ended with a presentation showing us the vision of the end result - an area of 440 hectares showcasing all 4 biomes in Oman and the entire flora found in them. A huge undertaking but will be so worth it! The Master presented a specially commissioned wooden “apple” to mark our visit. That evening we all attended a reception at the British Ambassador’s residence, which is situated in a picturesque setting on rocks overlooking the sea just outside Muscat. 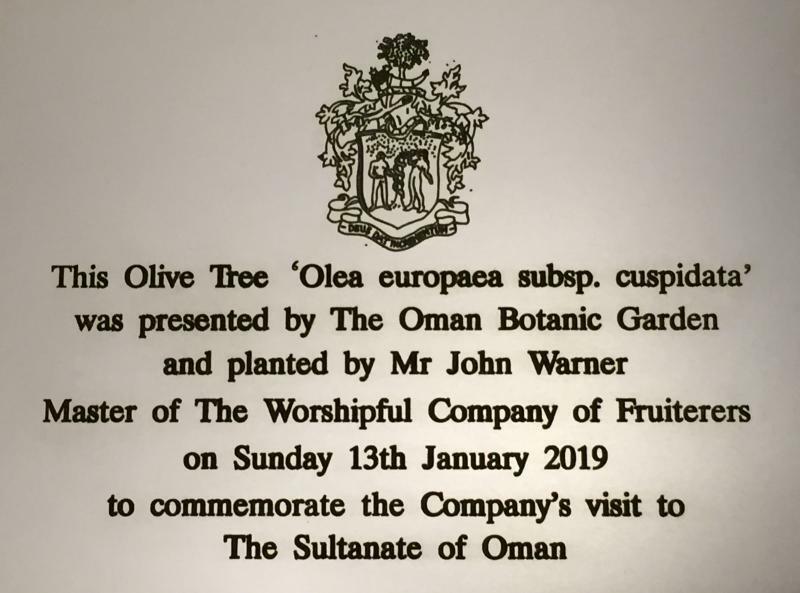 An olive tree which had been presented by the Botanic garden was planted outside the front of the residence so every visitor will see it; as is usual, the Fruiterers’ ceremonial spade was used for the planting – having travelled to Muscat via the diplomatic bag! – and a Fruiterers’ commemorative plaque was presented to the Ambassador together with another wooden “apple”. Our final day in Muscat took in another picturesque drive along the coast, with visits to a sinkhole at Bimah, a dam and reservoir at Wadi Arbayeen and the remote but beautiful Wadi Mazara. There is a theme here. Water was historically so scarce and so critical in an intensely hot climate that it is refreshing just to see it and notice what a huge difference it makes to the surrounding vegetation; in a good many places there was practically no surrounding vegetation at all. That day concluded with a Gala BBQ Dinner on the lawn of our Hotel. A wonderful location by the sea overlooking the coast of Muscat. This time it was our guide Qais who was the recipient of the final “apple”! Most of the group then departed for home and elsewhere. Seven of us, including the Master and Mavis, flew south to Salalah. This is where John and Mavis lived while in Oman so we had some fascinating photo opportunities recreating ‘80s photos that Mavis brought with her. The contrast with Muscat was very noticeable; Salalah, although nearer the Equator, has a cooler climate due to the summer mini monsoon which allows the cultivation of bananas, coconuts and other tropical crops. Further inland and at altitude is the centre for production of frankincense which made the region very important right from the time of the ancient Egyptians – and probably before. We spent an unforgettable night in the ‘Empty Quarter’- the largest area of sand desert in the world! Very basic, but amazing! Just the seven of us! Pop up ‘igloo’ tent with a mat on the floor! Our two guides prepared the most wonderful meal seemingly from nothing! Next day was spent travelling back to Salalah, stopping on an open rocky plain and discovering ‘geodes’ in the sand! Then coming to an oasis in the middle of nowhere and a small village community! We visited Sumhuram, an historic port for frankincense where traces of ancient trade routes far both to East and West have been found. The ruins have been partially restored very sympathetically to show the different sections of the walled city. We also visited two important tombs - those of Bin Ali and the prophet Job. Very much simpler in build and decoration than Muscat’s Grand Mosque but no less atmospheric. Too soon the trip ended! 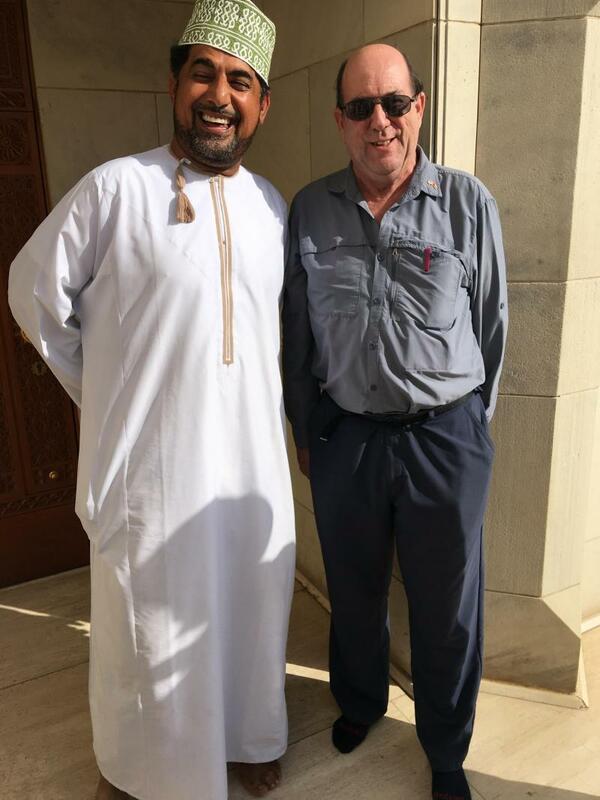 Thank you, John and Mavis for allowing us to understand why you have such a draw to Oman. It was an eye opener to a country so steeped in history and beauty and every Omani that we met was so happy, charming and helpful. It is a trip none of us will forget.